The present average temperature T of the earth's surface, taken at any one time over the whole surface of the earth, is close to 15°C (288 K). Thus, even though the temperature varies with time and place, the earth's surface must therefore radiate much like a blackbody at 15°C. Figure 3-5 shows the intensity of emission I(\) for blackbodies at 255 and 288 K. The wavelength for maximum radiation intensity is about 10 ^m in this temperature range, that is, in the infrared region of the spectrum. 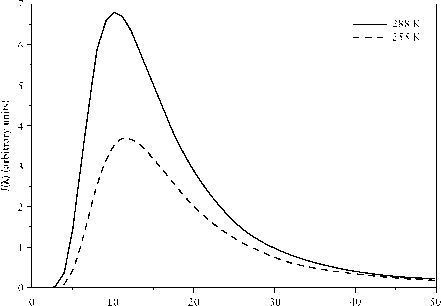 FIGURE 3-5 Radiation intensity (in arbitrary units) versus wavelength for black bodies at 255 K (dashed curve) and 288 K (solid curve). Therefore, to satisfy the law of conservation of energy, the earth-atmosphere system must be radiating energy into space at an average of — 18°C. Therefore, the earth cannot be radiating energy out into space directly from its surface, at least on the average. Average temperatures in the neighborhood of — 18°C are found in only two places from which radiation could logically occur: near the tropopause and in the region of the mesopause in the upper atmosphere. Since radiation cannot occur in the atmosphere unless many molecules are present to radiate, it is probable that most of the earth's radiation into space occurs from the atmosphere near the tropopause, probably the upper regions of the troposphere. This leaves us with two related questions: Why does the earth radiate to space mostly from the atmosphere and not from the surface, and why is the surface of the earth hotter than it should be, considering the energy balance calculations? That is, what traps heat between the surface of the earth and the tropopause? Both these questions have to do with the absorption of infrared radiation by atmospheric water vapor, carbon dioxide, methane, and small amounts of other gases. Figure 3-5 shows that the earth's radiation is almost all in the infrared, whether we consider radiation from the surface (blackbody at 15°C = 288 K) or from the atmosphere (blackbody at —18°C = 255 K). 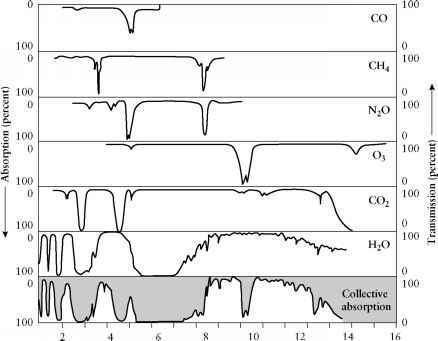 The absorption bands from 1.0 to 15.0 ^m of CO, CH4, H20, C02, and some of the other gases present in the earth's atmosphere are shown in Figure 3-6. The fraction of the earth's radiation absorbed at each wavelength depends on the amount of each gas present in the atmosphere and on the "strength'' of each absorption band. Looking at Figure 3-6, one may observe that the gases normally in the atmosphere absorb in different regions of the infrared. In fact, the earth's infrared radiation is absorbed almost completely in many wavelength regions; this is true except in those wavelength regions that are called "atmospheric windows.'' These can be seen in Figures 3-3 and 3-6 as the regions in which the atmospheric transmission is close to 1.0 (Figure 3-3) or 100% (Figure 3-6). As we expect, Figure 3-3 shows that the atmosphere is almost completely transparent in the visible region of the spectrum, and that there are numerous complete and partial "windows'' in the infrared. Both figures show that the region above 14 ^m is almost completely opaque to infrared radiation, but the atmosphere is mostly transparent to the longer wavelength microwave radiation, especially the region that Figure 3-3 shows as radar bands. FIGURE 3-6 Absorption of some atmospheric gases in the infrared spectral region. Redrawn from M. L. Salby, Fundamentals of Atmospheric Physics. Copyright © 1996. Used by permission of Academic Press. around 9.5 pm, in which O3 is a strong absorber. We may note from Figure 3-6 that there are absorption bands of CO2 in the atmospheric "windows" just below 5 pm and near 10 and 13 pm. CH4 absorbs in the atmospheric "window" near 8 pm. This means that changes in the atmospheric concentration of these gases, and of others, including the chlorofluorocarbons discussed in Section 5.2.3.2, which can absorb more radiation in the infrared "windows," will be important in the discussion of global climate changes in Section 3.3.3. The infrared radiation that is absorbed in the troposphere and in the stratosphere would warm these regions of the atmosphere substantially if energy were not also radiated from these regions. This is the energy radiated at an average temperature of — 18°C (this average includes the higher temperatures at which radiation from the earth's surface escapes through the atmospheric windows) that leaves the earth. Thus, the atmosphere intercepts infrared radiation from the earth's surface and then reradiates the energy both back toward the earth's surface, thus warming it, and upward to space, thus cooling the earth so that the constant solar radiation does not slowly increase the earth's temperature. The earth's surface can therefore be much warmer than the average radiation temperature of the earth. This phenomenon is usually called the "greenhouse effect'' because a related phenomenon is observed in a closed greenhouse. The glass or plastic windows of the greenhouse allow the visible solar radiation to enter the inside, but the upward-directed infrared radiation from the floor is absorbed or reflected by the same windows. In contrast to the "greenhouse effect'' in the atmosphere, however, energy retention in the greenhouse is caused mostly by lack of convection (i.e., lack of mixing of the interior air with the surrounding atmosphere). The same effect occurs in a closed automobile that is left out in the sun. Both the greenhouse and the car interiors may thus become considerably warmer than the temperature of the surrounding atmosphere. A greenhouse coefficient may be defined as the ratio of the surface temperature to the absolute radiation temperature of the whole system. For the earth, this coefficient is 288 K/255 K = 1.13, while for the planet Venus it appears to be 743K/233K = 3.2! Venus thus has a much larger greenhouse effect than earth; this is presently believed to be caused by carbon dioxide, sulfur dioxide, and possibly chlorine gas in the Venusian atmosphere. The Martian atmosphere contains mostly carbon dioxide but is so thin that the greenhouse coefficient is only 218K/212K = 1.03. For quantitative discussions of the greenhouse effect on earth, it is convenient to define the greenhouse effect somewhat differently, as discussed and calculated in Section 3.3.1. 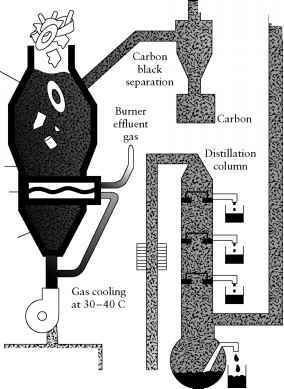 Further discussions of the greenhouse effect on earth, and how this effect may vary with changes in the content of carbon dioxide and other trace gases in the atmosphere, are in Section 3.3.3.